«©NCSX» You could be like everyone else and buy a boxy USB hub that was designed by an engineer. A by-the-book engineer who wears a polyvinyl pocket protector that holds exactly five Energel 0.5mm ballpoint pens. 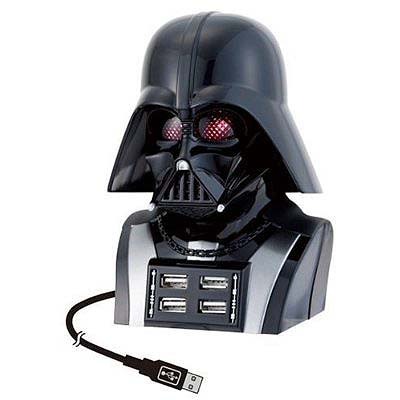 You could also pay tribute to your Star Wars inner geek by snagging an R2-D2 or Darth Vader USB Hub. If you should opt for the R2-D2 version, you'll get four USB ports to plug devices into and a little droid which swivels its dome and makes beep-boop sounds. 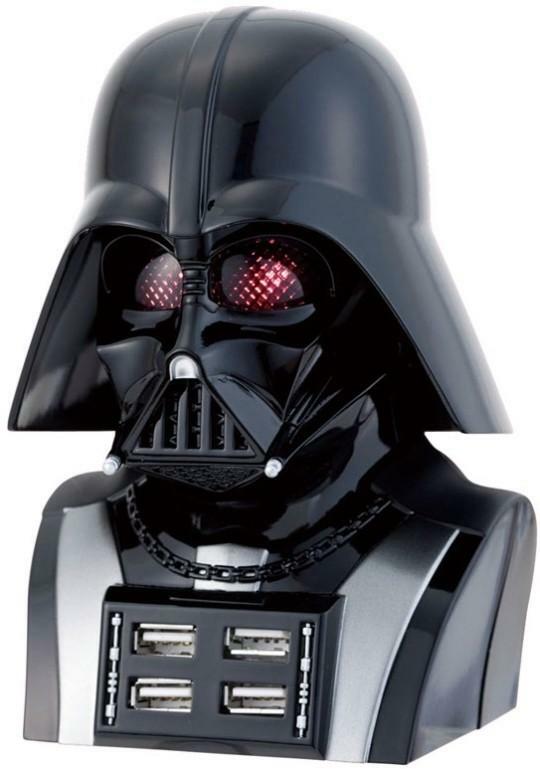 Purchasers of the Darth Vader USB Hub will also get four USB ports but instead of a little droid, they'll get the ominous visage of the dark Jedi Knight with blinking red eyes. Upon plugging in the Darth Vader USB Hub, the Jedi will breathe thrice, his eyes will light up red, and he'll turn his head a couple of times as if surveying his surroundings. When a device is plugged into the unit, the sound of light sabers swinging may be heard and Darth's eyes will light up red once more, and his head will turn once. Upon plugging R2 into a PC or MAC, it'll make distinctive beeping-booping sounds, spin its dome a bit, and bright red and blue lights will shine from the port on R2's dome. After three seconds, the red and blue lights will continue to shine but there doesn't seem to be a way to toggle them off. The back of R2 will also shine with a orange light. The lights blink in alternate fashion. 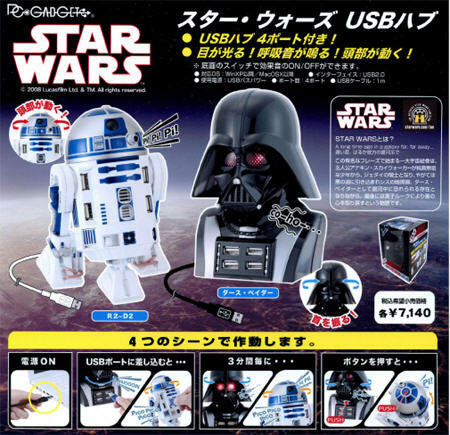 When a USB device is plugged into R2, it'll produce a different set of beeping sounds which seems to indicate that the droid is communicating with the inserted USB device. R2-D2 will also swivel its dome one time. Once the droid is settled in, it'll twist its dome and make a beep-boop sound once every three minutes to remind you that it's there. Pricing in Japan is set at JPY7140 (ouch) or US$73.90 each and new orders are welcome to ship today. The Star Wars Kubrick series outsells pretty much every other Kubrick toy we've stocked thanks to a devoted fan base. The world doesn't need another plain lotion dispenser but it could use a Star Wars R2 Droid Shampoo Pump Dispenser which takes a detour from conventional designs. Last year, Japanese manufacturer Heart released an R2-D2 Wastebasket that sold well despite the high cost of procurement. Heart is at it again next month with a Japan-exclusive Star Wars R2-R9 Wastebasket where the red and silver droid accepts refuse.